Posted on March 15, 2014 by Cynthia G.
Spring Equinox is on the way, and we’re dedicating a week our delicious deity. 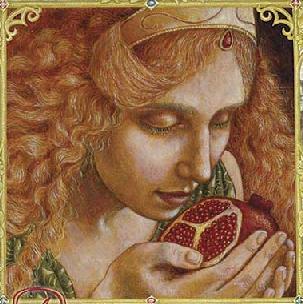 The sap is rising and Persephone is itching to make her escape from the underworld. As a husband, Hades has his faults but he lives in style and there isn’t a reservation that can’t be had as Mrs. Hades. Still, spring beckons. The daffodils are rising, and the bleeding hearts. Asparagus is in season and ewes are lambing. Besides, Hades is hot, but he is no George Stephanopolis. In the end, she reminds the poor old dear that a weekend away at Spa Equinox was part of the deal. Goddess bless separate vacations. This entry was posted in blogging, culture, fiction, poetry, Relationships, women, writing and tagged creative non-fiction, goddess, imagination, magic, mythology, Persephone, spirituality, spring equinox by Cynthia G.. Bookmark the permalink.